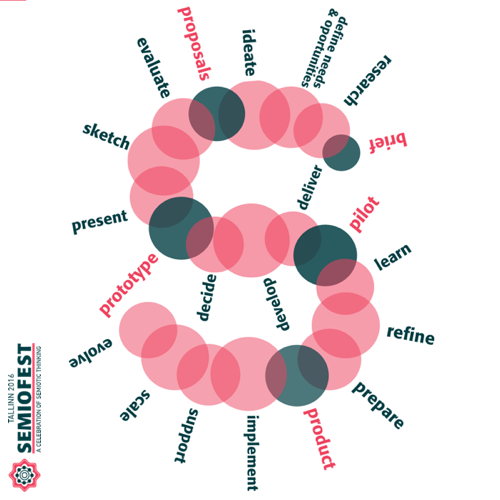 Semiofest Tallinn invites you to explore one of the most important problems facing countries, economies and entrepreneurs alike by asking how can semiotic thinking be applied to foster innovation. Call for Papers in open, deadline for proposals is February 1, 2016! Semiofest Tallinn 2016 will explore one of the most important problems facing countries, economies and entrepreneurs alike by asking how semiotic thinking can be applied to foster innovation. How can we contribute to build a culture of innovation? We invite you to present your experience and vision of semiotics as a tool of innovation: Reflect your experiences of innovation working with companies, governments or communities; share the tools and models of innovation that you have applied in your work. How can semiotics be applied semiotics to provide insights in any step of the innovation cycle, from mapping out the needs and opportunities for innovation to embedding new products and services in new markets across sectors? We also invite you to explore the culture of innovation within semiotics: How can applied semiotic thinking bring about change in semiotics? What new perspectives, methods, and insights originate from practical applications? What are the emergent trends and new fields for applied semiotic research? What is your vision of the future of applied semiotics? We also invite you to make explicit the innovative aspect of the our own everyday work. Semiotic thinking is always in the service of innovation. You can’t do things differently or be inventive without grasping the cultural or communication context. With the help of semiotic thinking you can discover fresh spaces for innovation and can arrive at unforeseen alternatives that lead us to fresh solutions. You can use it for deep diagnostics, for quick insights or to spark inspiration. It helps to make sense of the complex factors that frame any new development and uncover cultural trends that work either for or against any novel product, service, process or application. It is a route to innovation by shifting perspectives! your name, organization and job title. three takeaways that the audience will benefit from. Let’s create together an atmosphere of sharing and learning, June 1—4, 2016, Kultuurikatel, Tallinn, Estonia. More on Semiofest’s home page. Semiofest on Facebook.